The amount of freight lifted on the railways in the second quarter of 2015-2016 was down 18.4%, compared with the corresponding period last year. Office of Rail and Road (ORR) statistics released on November 25 show that 21.1 million tonnes were lifted in the three-month period. This is the second lowest Q2 and third lowest quarter overall since the start of records in 1996-1997. Overall, freight moved 4.4 billion kilometres in 2015-2016 Q2, representing a 16.5% fall compared with the same quarter last year. This is the lowest Q2 since the start of the quarterly series and the fifth lowest total in any quarter since records began in 1998-1999 Q1. There has also been a decrease in the number of freight train movements. The highest number recorded was 455,561 in 2005-2006, while the lowest was 265,559 in 2010-2011. In 2014-2015 there were 282,300 train movements. This is partly down to the mild winter and greater use of biomass resulting in less coal having to be transported to restock coal-fired power stations, the ORR says. 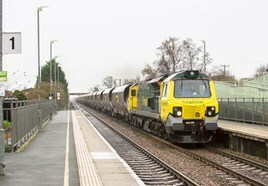 Overall, rail freight accounts for 6.5% of all UK freight lifted, while road accounts for 88.5%. For much more on this, read RAIL 789, published on December 9.